We already introduced you to almost all of the characters that you will get to fight with when Ghost War launches. You can read about them in Part 1, Part 2, and Part 3. Today, we would like to show you the last of them, but not the least, final classes: Assassin, Diversionist, and Sentinel. Utilizing more than pure force, these classes are bringing the fight to the next level with their mind games. Assassins are the Assault force your enemy cannot see coming until they hit them. They are very hard to mark – in fact, opponents cannot mark them unless they spot them from less than 50 meters away. This makes them perfect for sneaking behind the enemy lines and taking them down from behind. Their specialty is short-range surprise encounters. Imagine this: A Sniper is harassing your teammates. With your abilities, you are able to go around her squad and take her down before they even notice you, allowing your own squad to fight back. 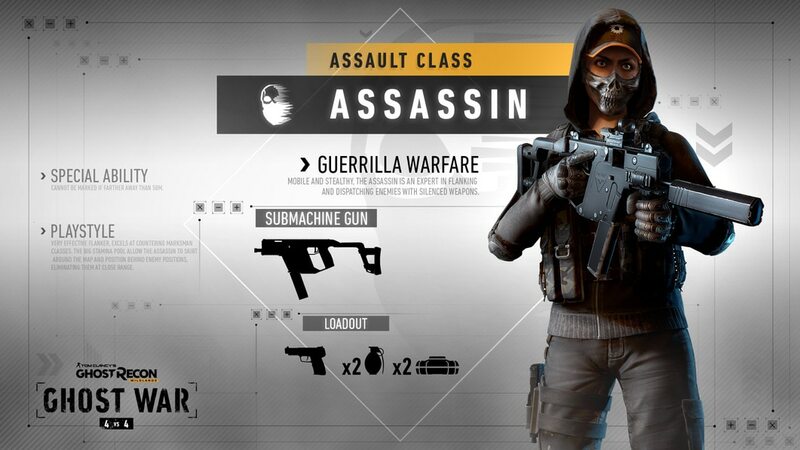 Assassins come equipped with a submachine gun, a pistol, grenades, and a mine. They are an excellent way to counter Snipers as they can sneak past a typical enemy perimeter. When you are playing against an Assassin, never forget to watch your back. They are an excellent choice for the players who like to remain unseen and flank other players. If you enjoy deceiving your opponents and gaining advantage that way, you should consider playing with Diversionists, one of the Support classes. Diversionists are capable of misleading enemies, drawing them away or leading them into a trap. Diversionists’ drone is capable of making a noise that sounds so much like a gunshot that your opponent will not be able to tell the difference. They might follow the sound… straight to your trap. Imagine this: Two enemies are tracking you. They seem to be heading for your position, so you launch the Noisemaker drone and activate its ability a bit furtherfarther, away from where you are. One of the enemies is distracted, looking away, so and you getare able to kill the other and run away. 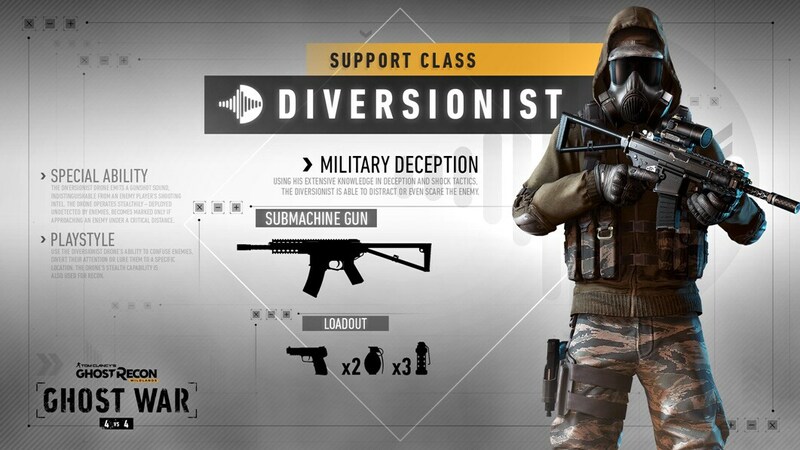 Diversionists come equipped with a submachine gun, pistol, and two types of grenades, : frag and flashbang. While their specialty is to work from the shadows and confusing confuse opponents from afar, they are just as deadly in close encounters. Sentinels are very skilled Marksmen, capable of scouting long distances thanks to their tracker. They can place this device wherever they believe enemies are likely to step into – when they do, Sentinels are automatically alerted, no matter how far away they are. 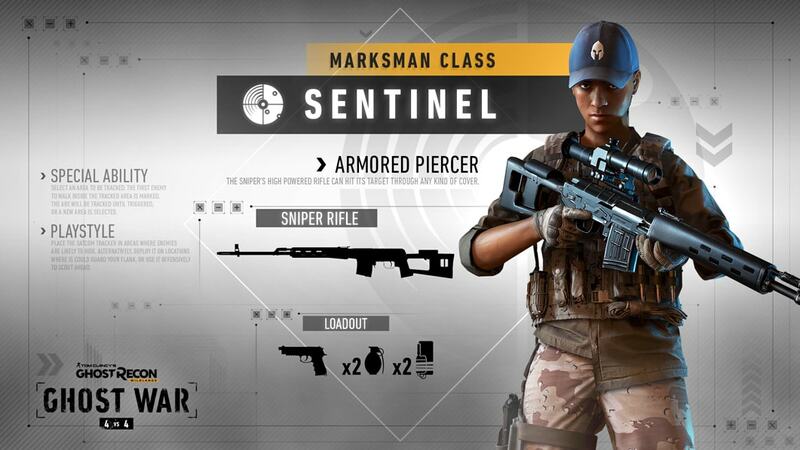 If you are in their sight when you trigger the alarm, beware – Sentinels come equipped with a very dangerous sniper rifle, with a special armor-piercing ammo, capable of penetrating many types of cover. Imagine this: Preparing for a flank, you place your Satcom Tracker behind you and you throw a C4 in the same area. Shortly thereafter, an Assassin steps on the Satcom tracker, warning you that you can safely blow him away. Their tracker can be used once, until triggered or placed elsewhere. Apart from sniping, Sentinels can be deadly with pistols, grenades, and mines. Remember, you can customize the appearance of all these characters the same way you can customize your Ghost in the main campaign through the Charactersmith. Those are all the characters that will be available in Ghost War at launch – do not forget that there are more characters, maps, and features coming in post-launch updates! Stay tuned and remember to visit our social media channels and forums if you want the freshest intel. Ghost War is launching on October 10th on all platforms (Playstation®4 system, Xbox One and PC). For more on this event, go to the official portal and be sure to visit our official forums to share your feedback, or join the Ghost Recon: Wildlands Discord server to find other players to play with.